Normal style DC power supplies for effects pedals. Analog Man carries the Boss/Ibanez style Euro 9V Power Supply. 9V dc 200mA power supply for most Boss/Ibanez type pedals. All analogman battery powered effects with power jacks also use this adaptor. Analog Man carries the Boss/Ibanez style UK 9V Power Supply. 9V dc 200mA power supply for most Boss/Ibanez type pedals. All analogman battery powered effects with power jacks also use this adaptor. Analog Man carries the Boss PCS-20A Daisy Chain Cable. This parallel DC cord is designed for connection to pedals including the NS-2, LS-2 and TU-2 in order to supply power to up to seven additional pedals, "daisy-chain" style. Analogman carries the Boss SD-1/808 - We now sell new Boss SD-1/808 pedals due to popular demand. These are brand new Boss pedals in the original box with manuals, with our various mods. Analog Man modifies the Boss DS-1 distortion into our DS1/Pro specs, with optional MIDRANGE knob to make an awesome sounding distortion pedal. Analog Man presents the Boss MT2/Pro - The MT2/pro mod takes all the fakeness away, all that cocked-wah super-saturated, harsh, big hair distortion. It leaves plenty of distortion available but you can hear the guitar's actual sound after the mod. 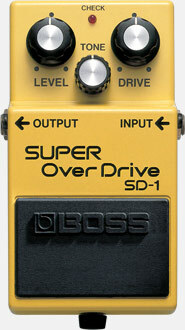 Analog Man presents the Boss BD-2/Super. The BD-2/Super can get a VERY pure clean boost sound after our mod, more transparent than a tube screamer due to less midrange boost, compression, and distortion. Visit our website for more info.